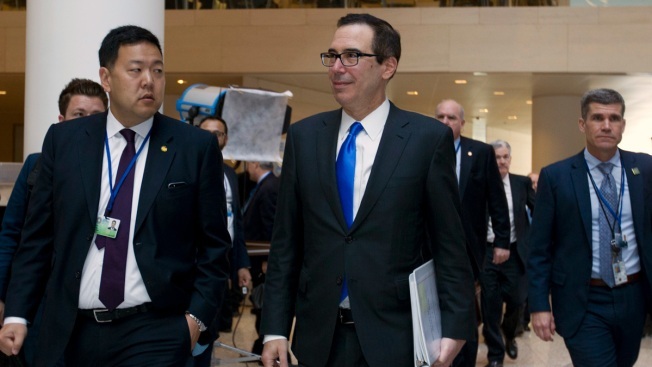 Treasury Secretary Steve Mnuchin, right, accompanied by Deputy Assistant Secretary Jason Chung arrives to the G-20 meeting during the World Bank/IMF Spring Meetings, in Washington, Friday, April 20, 2018. The International Monetary Fund and the World Bank repeatedly warned at their meetings this week that intensifying trade tensions could jeopardize a healthy global economic expansion. But U.S. Treasury Secretary Steven Mnuchin expressed cautious optimism Saturday that countries could settle their differences without a trade war. Mnuchin met during the past three days with financial officials from China, Japan and Europe over a series of punitive tariffs unveiled by the Trump administration against China and other trading partners. In a session with reporters, Mnuchin refused to say how close the United States was to resolving the various trade disputes, but he did say progress had been made. The United States and China are on the brink of what would be the biggest trade dispute since World War II. Each has proposed imposing tariffs of $50 billion on each other's products; President Donald Trump is looking to impose tariffs up to $100 billion more on Chinese goods. In a speech earlier this month, Chinese President Xi Jinping vowed to open China's market wider to foreign companies, raising hopes the dispute with Washington could be resolved. Mnuchin said he discussed Xi's proposals with Chinese officials. "We are cautiously optimistic," Mnuchin told reporters, saying that he may soon travel to Beijing for further talks. The Commerce Ministry in Beijing said Sunday that China welcomes a visit from the U.S. to Beijing to discuss trade issues and confirms it has "received information" regarding Washington's interest in such a trip. Trade tensions dominated the three days of talks among top finance officials attending meetings of the Group of 20 major economies, the 189-nation International Monetary Fund and its sister lending agency, the World Bank. The officials roundly criticized Trump's get-tough approach to trade, a reversal of seven decades of U.S. support for increasing freedom in global commerce. In his speech to the IMF's policy committee Saturday, Yi Gang, the head of China's central bank, said that global growth could be hurt by "an escalation of trade frictions caused by unilateral actions," an obvious reference to America's threatened tariffs against China. Mnuchin insisted that the United States was not trying to provoke a global trade war but seeking to protect American jobs from unfair competition. "The president has been very clear on what our objectives are," Mnuchin said. "We are looking for reciprocal treatment. This is not about protectionism." There were signs of conciliation. The U.S. dropped its objection to the first increase in the World Bank's capital resources since 2010, clearing the way for the bank's board to OK a $13 billion increase in its capacity to make loans to poor countries. The move was tied to a package of reforms the U.S. had sought. Both the World Bank and IMF held meetings of their policy committees on Saturday. In a closing communique, the IMF expressed concern that the rising trade tensions could dim what at the moment are bright prospects for the global economy, which is expected to grow this year at the fastest pace since 2011. On Friday, Mnuchin had called on the IMF to do more to police countries running large trade surpluses, a role that has traditionally been left to the Geneva-based World Trade Organization. The final IMF communique did state: "We will work together to reduce excessive global imbalances in a way that supports global growth." The communique did not spell out how this would be accomplished.